Historically Ruger has built outstanding durable and extremely high quality firearms with innovative features all for a reasonable price. Over the years we have seen truly unique designs which have become industry standards such as the GP100, 10/22, Mark III, and New Model Blackhawk which all have put the unique Ruger spin on classic firearms. Truly new designs were slow to trickle out with most "new" products being innovations of old line products rather than completely new guns. About five years ago someone at Ruger apparently found and pushed the product development turbo button and since Ruger has been on a product release rampage with new products seemingly released monthly. 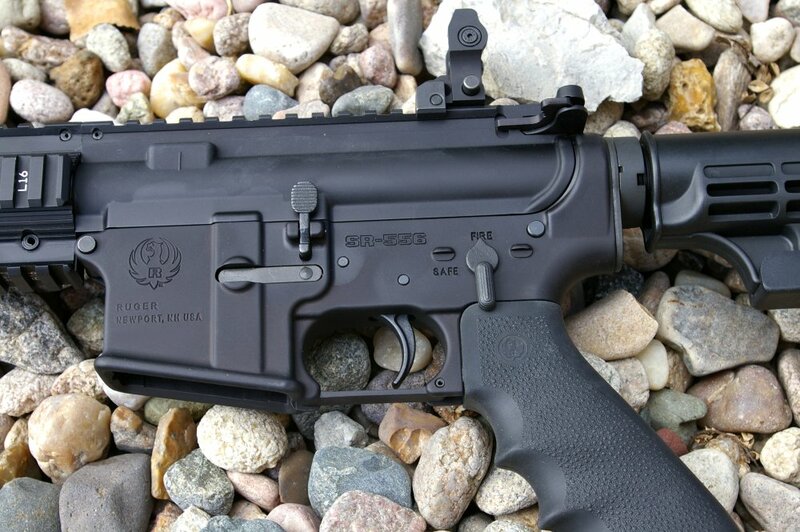 The Ruger SR-556 line is a new from the ground up AR15 based product line which fills the obvious AR rifle void in the Ruger line up. 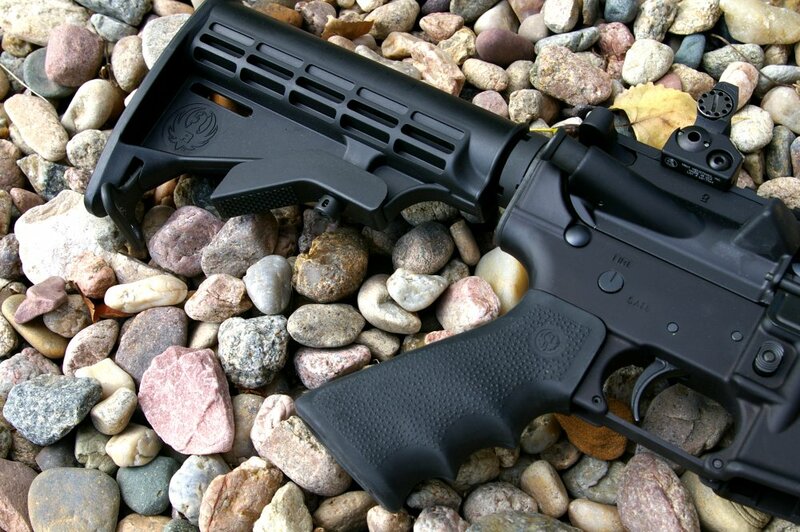 When Ruger introduced their AR format they did so in their typical fashion of solid feature rich value based design. The SR-556 line is essentially a standard high quality AR15/M4 spec and compatible lower and upper receiver paired with a new Ruger tweaked piston driven system versus a standard direct impingement system... more on that difference later. Customer wants netted several product versions based on the same familiar AR15/M4 compatible platform we are all familiar with; including several complete uppers to upgrade and pin on your existing AR/M4 format rifle and several complete rifle versions. Variations include calibers in 5.56/.223 and 6.8 and various accessorised versions and also a stripped down SR-556E “Economy” version. The base rifle is the same with models differing by level of accessories, barrel length and weight of barrel. I chose the SR-556C "C for Compact" which is a feature loaded rifle complete with sights and upgraded picatinny forend rail system. If you put together a wish list of everything you would want in a rifle minus optics, the Ruger SR-556C would include it in a ready for the range package. 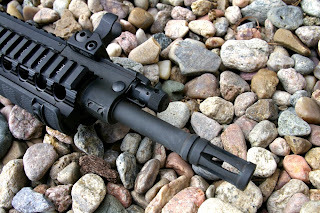 Primarily what makes the SR-556 line unique is a piston driven system versus a standard AR15 which has direct impingement. Direct impingement siphons off a little gas exiting the barrel at the gas block; usually the gas block is also combined with the front sight block. That little blast of exiting gas blows a blast of gas back via a small tube to the gas key on the bolt which contains a small piston. 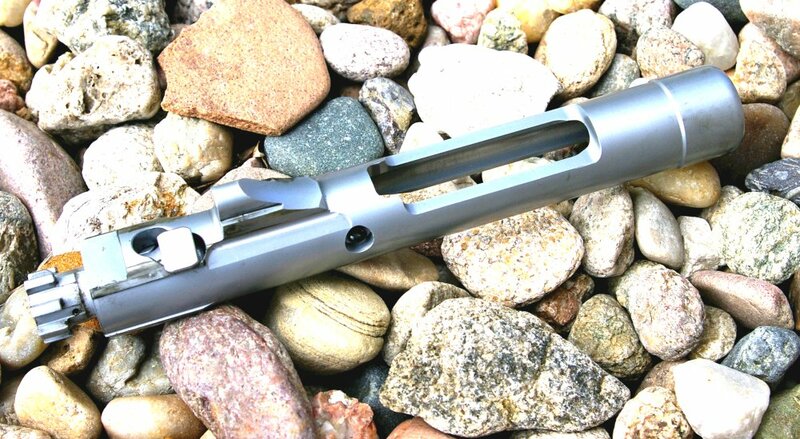 That piston unlocks the bolt and the bolt carrier cycles the action, ejects the spend casing, and loads a new round from the magazine. The end result of many blasts of gas is the action can get pretty dirty and hot and start to malfunction after many rounds are fired. 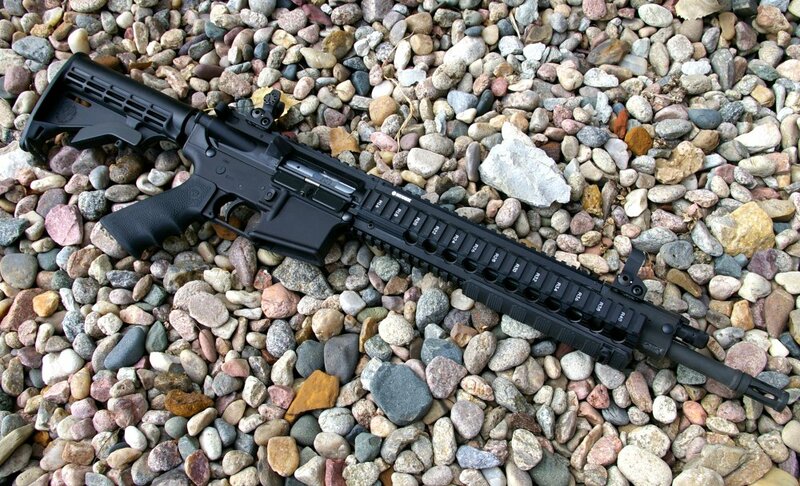 To resolve this issue piston conversion kits were developed to convert a standard AR15/M4 to something that would run exponentially longer and potentially cooler than the older system ever could. This new system basically moves the piston from inside the bolt to the front of the rifle onto the gas block. The bolt cycles in the same way except via a push-rod instead of gas. The gas only travels less than an inch actuating the piston in the gas block which in turn moves a solid rod that cycles the bolt way back in the action. 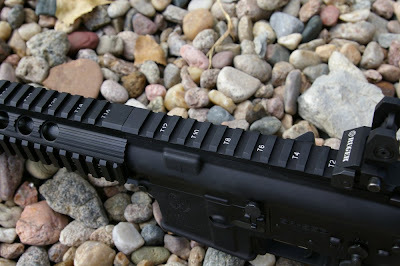 The excess gasses are vented forward out the front of the forend away from the shooter. The end result of this piston movement shell game is that no hot gas and accompanying crude are blown back into the receiver and bolt area of the rifle, so it runs way, way longer before gunk based malfunctions occur and is essentially cool running. Cool running is more comfortable to shoot, yes, and in theory less heat equals less metal part fatigue which equals substantially longer run times in the ten of thousands of rounds before bolt parts replacement are necessary. The other advantage of many piston driven systems, such as Ruger’s 556, is that it can be tuned on the fly via a simple knob. Tuning allows the user to adjust the amount of push the pushrod has from none all the way to quite a bit. Setting #0 turns the piston system off to make the SR-556 a single shot hand cycle gun to eliminate noise with suppressor use. 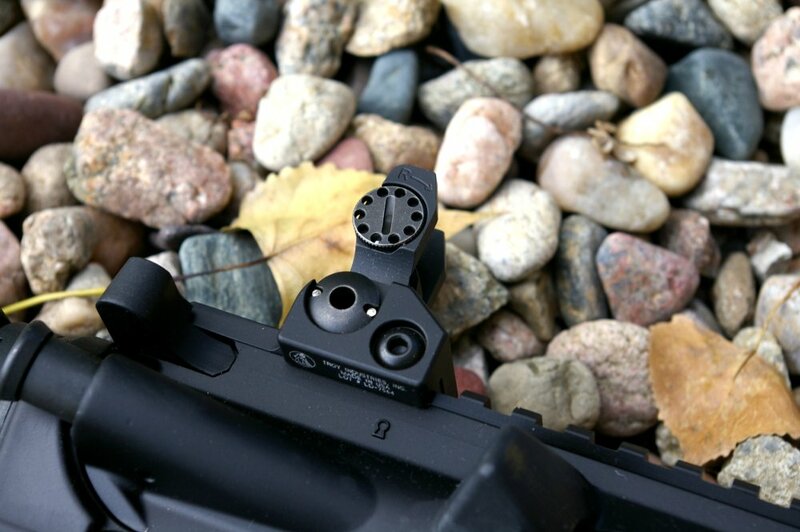 Ruger’s SR-556 Piston system also offers #1, #2, & #3 settings as well with setting #2 being the standard setting. Depending on the rounds used or the situation. If the user feels the gun is cycling too hard they can lower the setting, if the guns starts to fail to feed/cycle as the gun gets dirtier and dirtier (think thousands of rounds) the user can increase the setting for harder bolt cycling that will assure cycling. This is a great idea for budget shooters who may have odd charged cheap ammo and hand loaders out there who are playing around with sub-sonic and higher velocity rounds which can cause feeding issues on typical direct impingement rifles... you can tun the rifle however you like. For the folks planning on having a rifle that will function over the long term the piston-driven system allows you to tune the gun easily should you start to have cycling issues in the field without having to result to a full gun cleaning. FIT & FINISH - Fit of the Ruger 556C is typical Ruger first class tight like a bank vault construction with not significant play between the upper and lower receivers. The finish is excellent and is everything you would expect from a Ruger branded firearm. Ruger does not list what level of anodizing or finish are applied the receiver and parts, however as Ruger has a long history of quality, you can assured it is of the highest quality. 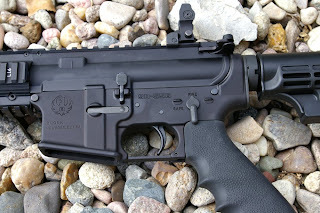 Of note, the Ruger 556 line is all 100% made in the US with 100% US parts which does add to the price, however most will agree this certainly contributes to the quality. One nit pick is that the elector and bolt release are clearly cast or forged however these were very rough finished parts on my rifle however they did perform perfectly. FUNCTION - I had no issues from a function perspective running basic dry-fire drills and shooting drills with the setting on the standard #2 and on setting #0 the SR-556C functioned perfectly as a single shot. Throughout the testing of over 1000 rounds, I never cleaned the rifle and did not have one single malfunction which I was very impressed with. All the Magpul Pmags dropped free without a problem and all the standard AR controls worked just as they should. I noticed only minimal wear on the carrier, which indicates that Ruger has addressed the carrier tilt issues seen in many piston driven rifles. Throughout my testing I saw no reason to change from the factory #2 setting, however playing around I did move the Ruger 556C piston to setting #3 and it did produce a more noticeable snap and did start dropping brass behind instead of next to me. The #0 position would be great for suppression however I saw no noticeable accuracy advantage operating in this position. 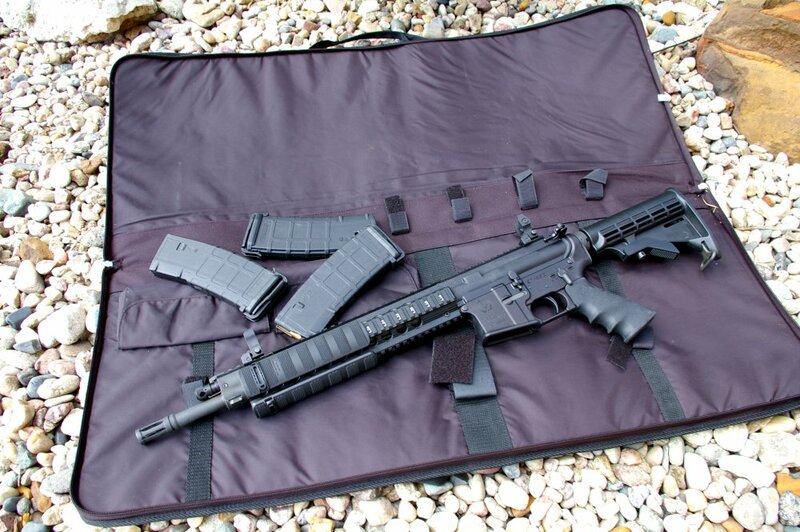 FEATURES - The Ruger 556C includes the same upper and lower receivers, stock and upgraded Ruger branded Hogue Rubber grip and upgraded hammer forged barrel as the other standard models and is chambered in the standard Nato 5.56 caliber which will also shoot .223 just fine. 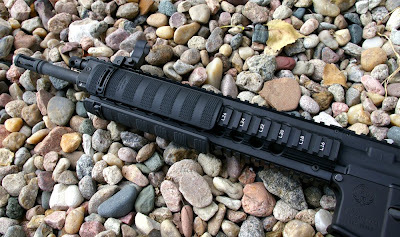 It also includes a very high-end quad continuous rail forend that extended the top rail all the way to the end of the forend providing plenty of real estate for attaching everything from optics to lights to lasers. The forend is very rugged but is not fully floated and is pinned at each end to the receiver and gas block. Similar forends typically run in the $400 range. Other upgrades are the inclusion of Ruger branded 6-position stock, T-markings on the reciever and forend, fully adjustable Troy front and rear folding sights, and Troy forend handguard covers. 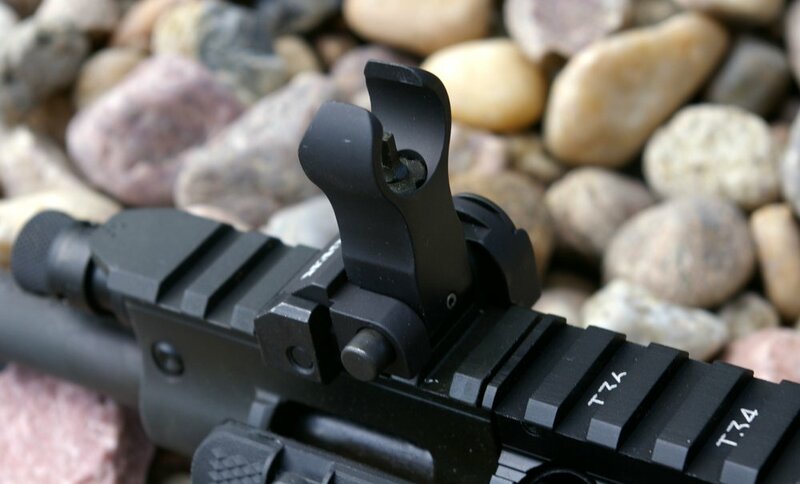 Troy sights are regarded as the best folding sight on the market and generally go for around $350 per set, so this is a pretty huge upgrade. Of course you also have the factory installed piston driven system as well, which is a $400 upgrade from most manufacturers. The bolt is also chromed which is a typical $100 upgrade. Other upgraded features are the hammer forged chrome lined 41V45 barrel which would be a $200 upgrade at the minimum for increased accuracy and long-term durability. The “556C” model’s barrel is compact which means that the barrel is legal 16.125” including the permanently attached flash hider. The result is a more maneuverable military spec length gun that is 2” shorter than 16” barreled guns with removable 2” flash hiders. 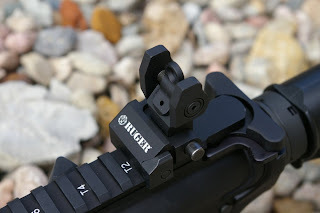 For home, defense, or police duty rifle work this would be the rifle of choice from the Ruger line up as that 2” shorter length makes a big difference moving around obstacles. Other accessories included are three 30 round Magpul magazines, a really nice soft-sided zippered case with internal and external pockets and velcro tabs, Troy rail covers, and a firearm lock. The SR-556C is truly a feature packed gun for the price. VALUE - With most AR15s you buy you will need to go pick up a couple magazines, sights, upgraded grips, a nice range case, and perhaps a forend. When you consider the Ruger 556C includes the premium level of all those items, the $1995 retail ($1400 street price) price tag does not seem that high. Ruger has added about $1200-$1300 of upgrades on this very high quality base gun. Although a few manufacturers offer excellent $800 rifles, it would be tough to end up with a gun this well equipped for Ruger’s SR-556C $1300-$1400 street price. 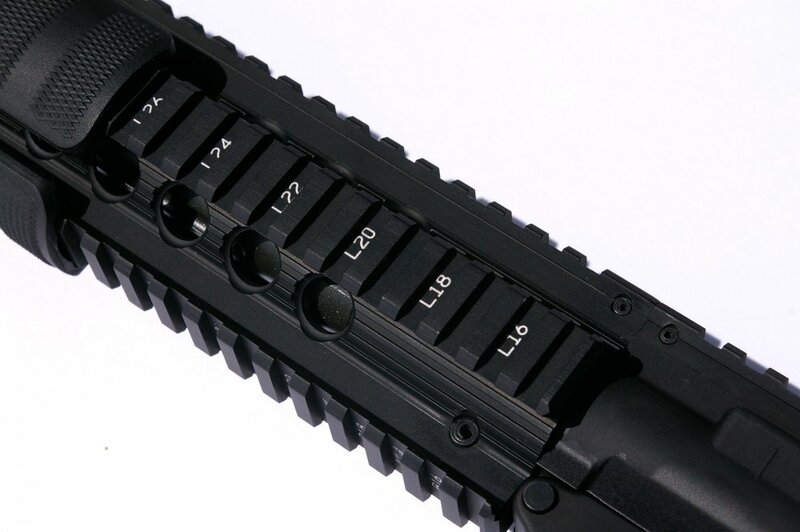 ACCURACY - One of the atypical trade-offs of piston-driven AR15 systems is that the extra weight up front hanging on the barrel will affect accuracy. Obviously the non-fully floated barrel does not help acuracy either. As such, the Ruger 556C delivered good 2 MOA type combat accuracy at 100 yards. After shooting several of the Ruger 556 Series of rifles, I have noticed they tend to deliver a group average of 1.67” @ 100 Yards. Now shooting both the 556C and 556CLA side-by-side they seem to have similar, but odd ammo preferences. One would think the lighter rounds would be the ones performing the best with the 1:9 twist, however the Ruger seemed to have preferences of random weight rounds. HORNADY 75GR MATCH - 1.98"
HORNADY 60GR TAP PFD - 1.57"
HORNADY 55GR TAP PFD - 1.76"
Winchester USA FMJ 62GR FMJ - 1.31"
Winchester USA FMJ 55GR - 1.84"
The Ruger 556C is a no expense spared highly upgraded rifle for about $400-600 more than a typical standard AR15 rifle that gives you everything you need for home defense, sporting, or tactical use right in the box. The advantages to the Ruger 556C is reliability assurances and a higher degree of tuning flexibility than direct impingement AR15 rifles. The Ruger 556C was a very accurate piston rifle, however my standard direct impingement rifles had a slight accuracy edge over the Ruger 556C. As most shots are well under 100 yards for the majority of tactical shooting, this seems a trivial point for this type of compact tactical rifle. The piston driven systems do offer recoil reduction compared to carbine length rifles, however because of the extra weight of the system the recoil was less noticeable than any of my mid-length rifles and definitely easier to shoot. The piston system does heat up the front forend quickly and if you like to grip the end of the forend, then you should plan on wearing gloves for extended shooting. This rifle is not light and part of that weight is due to the Hogue grip, steel Troy sights, with most of the weight being the overbuilt picatinny rail forend. I will mention that I am not a fan of any full picatinny forend rails unless they are very light weight. From my perspective they add over a 1lb of extra weight when most of us only attach a flashlight. 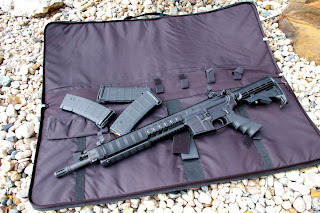 Some will love all the rails to hang 20lbs of crap from, however I am looking forward to completing the testing of the Ruger 556CLA which is basically this rifle on a diet. Everything about the Ruger 556C is engineered for durability and durability adds weight however that weight does make this AR very comfortable to shoot fast and furiously. If someone asked me what they should buy for a high end AR or loaded AR, I would have no hesitation pointing them to a Ruger SR-556C or the equivalent upper. Very reliable and durable rifle with good accuracy.